Confessions of an Ageing Motorcyclist: Don't panic, don't panic!!!! A couple of days ago, I received an email from Philip McDaid, IAM Chief Examiner; saying that it was time for my cross-check ride and what was I doing on Thursday? (today). The cross-check ride is virtually a mock run under a wide range of riding conditions of the IAM full membership test to ensure that I can consistently perform to the police rider standards which the IAM use as their baseline. Philip said he was happy to ride down my way from his Auckland base and I thought "Sweet - roads that I'm totally familiar with - that gets rid of a lot of stress"! We arranged to meet in the historic gold-mining town of Thames 50-odd km down the coast for a pre-ride coffee and I set off this morning under sunny skies and in an excellent frame of mind, although under no illusions that it was going to be a relaxing ride. Incidentally, in the photo below, the large catamaran moored in the background looks like it has a VW Kombi for a cabin, particularly with the 2 tone paint! Philip and I met up in Thames and over coffee, my relaxed demeanour changed somewhat when Philip explained that in order to be examined over the wide range of conditions required, we would NOT be riding on local roads, but would in fact be riding back to the Auckland area, using a mix of 2 lane roads, the Southern Motorway itself and driving in high density traffic in one of Auckland's southern adjoining towns! I thought I took the news pretty calmly given that the anticipated ride had just turned to custard but must have had a stricken look on my face which explains Philip's triumphant grin! The shock of an alternate destination with some unknown roads must have caused me to mis-hear some of the route (my story and I'm sticking to it!) but more of that later. The run from Thames in moderate traffic was really enjoyable apart from part-way along the predominantly 2-lane State Highway 2 when we caught up with a fuel tanker doing about 10 km/hr below the national open road speed limit of 100 km/hr. This was where the mind games started!! "Hmmm... I'd really like to get past this but to do so quickly, I'll need to go over the speed limit. Will Philip ping me for speeding or will he ping me for failing to make progress if I don't - oh heck, what to do?" Well, he didn't ping me for passing in a brisk manner, but he did notice whilst I was looking ahead for an opportunity that I'd drifted a little closer than the 2 second following rule when there was no need to do so! Fortunately, I was out to one side of the tanker or the "gentle reminder" might have been a bit more forceful! Traffic on the Southern Motorway was moderate and I felt completely comfortable with lane positioning, overtaking and situational awareness. Too comfortable as it happened as my brain had registered Papakura as our first destination, not Pukekohe. Consequently, I serenely sailed past the Pukekohe motorway off-ramp with not a care in the world until Philip came flying by and indicated to get off at the next junction. My stuff-up became painfully apparent when we stopped moments later to fit the radio comms ready for the part of the route I wasn't familiar with. Suffice to say that I felt a complete pillock when Philip said if I'd used my mirrors, I'd have seen him indicating at the Pukekohe turn. How abso-bloody-lutely humiliating!!! Philip also advised me to look out for "speed creep" on the motorway - easy to do when a fair percentage of the traffic is travelling above the speed limit! Time for some dense traffic work around the town of Pukekohe which has narrow roads, made even narrower by parked cars. It also seemed that there were tight radius mini roundabouts at every intersection with traffic coming at you from all angles. However, all the recent city riding practice must have paid off as it was stress-free with no incidents. Road positioning well away from parked cars helped no end. 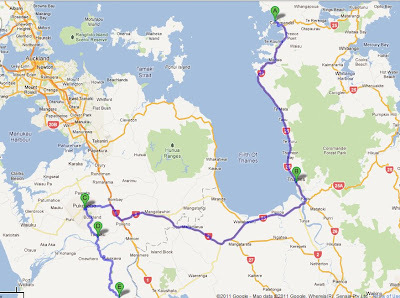 From Pukekohe, it was off south on the narrow twisty rural back roads towards Ngaruawahia. The conditions are similar to my local roads and I love 'em! It must have been apparent to Philip too as after 20 km or so, he called a halt to proceedings and said I'd nailed it - YESSS!!!! Absolutely over the moon, enormously proud and to be perfectly candid, more than a little surprised. It's really hard to maintain a sense of perspective when you're concentrating so hard and I thought that the fuel tanker incident and missing the motorway turn-off earlier in the day might have cost me dearly at this advanced level but Philip said that he could see that my overall skill level and riding plan was up to standard. Phew! Back to the Autobahn motorway service station for a late lunch and a debrief, Philip said that he'd be speaking to one of the other IAM Examiners to take me for the official full membership riding test in the very near future. So between now and then, It's practice, practice and even more practice! Starving after all the stress! Sooo..... 370 km for the day, including 2 1/2 hours of minutely observed riding by the Chief Examiner. Surprising how much it takes out of you and it's likely to be an early night! It's been seven months since starting out on this journey and it's hard to describe just how much the standard of my riding has improved. It certainly IS possible to teach an old dog new tricks! IAM is an amazing organisation where professionals such a commercial instructors, police riders and other people with unbelievable riding skills volunteer their time to help others raise their game - simply outstanding. Awesome Geoff.....just awesome. I was right there with you all the way, had to laugh a few timesnwhen reading this blog , can just so relate to your feelings and experince. Good stuff mate, well done. Cheers Rog - really appreciate your kind words. Excellent outcome Geoff and well done making the right decisions. So now you are just confidently sitting no stress waiting for the "DAY"....ha ha. Within 30 secs of my actual test starting I almost took a wrong turning out of the service area where we had met.....much hooting and arm waving from the examiner...much steaming up in my helmet. The main event will always be at a time to scare the crap out of me! Its great to share the journey that you have been on. So great to see how well you have done and as an "adopted son" from across the pond I salute you!! One of the things i love most about motorcycling blogging community is the support and encouragement we are all able to give, and sharing your IAM journey has been a pleasure! I'm in awe. Those 'test' situations make me freeze up and invariably stuff up (it took me three attempts to get my bike licence!) Well done Geoff - you're a star. Hearty congratulations on doing the cross-check ride successfully. I thoroughly enjoy reading about your progressions towards your IAM full membership and probably like many of your readers, are sure you will get there with flying colours. Good luck with the main event! Good job and congratulations! I can only imagine how stressful this was for you but instructors are human and I'm sure they understand what you are going through. They went through it too. I'm looking forward to your future posts with you being the observer and knowing how you felt as a student. Sounds like a great program, I'll have to see if I can find something similar here. We knew you'd do great. And just think of what you learned along the way. Not just on the journey as a whole but even on the one ride. Look forward to hearing more about the final test. You have no idea how much I've appreciated everyone's support in what has been and continues to be a tough course with no concessions! No wishing to be too graphic, but a test day usually involves several trips to to the toilet in quick succession. No-one is immune from nerves and it's no bad thing really! Cheers mate! Can't afford to let the guard down or be too casual for a single minute but at least the levels of concentration required are coming a little more naturally now. I think most of us are troubled by those little uncertainties and how to tackle them. And as for stuff-ups like missing the turn.... well, that's me all over! Actually, a timely lesson to pay attention as the Big One won't be too far away. See, there's some good come from the mistakes! Many thanks! Yep, I'm sure the instructors really enjoy a bit of student discomfort based on their own experiences! Enjoying following your journey too - it really resonates! Good luck with it all. Although the two books which form the basis for the training are for the left hand side of the road, the principles translate really easily. Raftnn has reviewed the Police Rider's Handbook here: http://rogerfleming-raftnn.blogspot.com/2011/05/police-riders-handbook-to-better.html available from Amazon. The IAM How to be a Better Rider is reviewed here: http://geoffjames.blogspot.com/2011/05/review-and-related-ride.html and is sometimes available through Amazon but also through the IAM in the UK. The latter book is outstanding. Thanks so much! You're absolutely right, the learning has been immense and apart from a short while when I doubted whether I could make it, it's been huge fun. There's no doubt that if I pass the full test, it will be a huge milestone and then training starts to be an Observer!!!! Still, life isn't meant to be easy, is it??? I was panicking just reading this. I would have been so nervous, and you seemed to have handled it cool as a cucumber. You're the man! Cheers Sonja! Not at all - I bet my eyes were as big as saucers. Wonderful what a helmet can cover up, haha! Okay, I'm stressing just reading about it! I wouldn't be able to do, I'd be a basket case. I don't even like ordinary riders behind me, let alone examiner types! Congrats on another good ride and acquiring all the skills - well done! Hahaha - it's totally intimidating in the early stages with the eyes of these riding gods boring into the back of you. However, when you begin to realise that they're human beings (almost)and your own confidence grows, then it's not so bad and you make more rapid progress. Thanks for the nice words - you never stop learning! Congratulations and well done. Now for the real thing... hehe. I can't be too cheeky as I had Philip follow me the other week as part of the defensive riding course. It is something special when Philip tells you that you have done things well and his critique is delivered with warmth. I, too, got told about position on urban roads and speed creep. And since that ride I am more aware of what I need to be doing all the time and much more aware when I don't get quite right - a bit of sack cloth and ashes is applied. Again, well done! Give that man a chocy fish!! Thanks Mark, yep - more angst to come and with a stranger to make it more interesting! Exactly! Praise or improvement suggestions from Philip are equally welcome as they're both delivered constructively. I understand the sackcloth and ashes comment...... riders trying to improve are always their own harshest critics! I know that I beat myself up for ages if I stuff up. Geoff, your excellent writing style really brings your adventures to life, so much so that I'm sure I was more nervous about your cross check ride than you were. Thanks for the nice words but you're far too kind!! I still get as nervous as heck beforehand but have got better during the actual tests by concentrating as hard as possible. Also, knowing that the examiners have all been super-nice people so far helps a lot too. Owe you a few beers for getting remote tuition from your videos! Yep, a video would be quite interesting. If I make it to Observer, must look at a GoPro or similar as they're worth a thousand words. Kudos and waiting to see when you start volunteering your time! Time certainly has flown and some of it has indeed been unbelievably hard work but as you say, it's tough having to go our riding so much :-). I'm actually volunteering some time now, but in the background. I've taken on the job of co-ordinating trainers and trainees for IAM. First step is building an NZ-wide relational database which is great learning all by itself! I was thinking about the whole journey the other day and there's a lot more under the surface that's happened than I'd realised. I won't tempt fate now, but if I pass the full membership test; I'll post up some stuff on the "hidden" part of the journey - could be an interesting exercise. Uss. I would love to learn what you are considering "behind the scenes". Glad to learn that you are already enjoying volunteering. Keep up the good work. Nicely done. I can identify with the stress. I've had police motor officers go to pot when they knew I was following and evaluating them. A lot of my training was done under the microscope of the Director. I remember the day when the butterflies starting flying in formation. Mental toughness is a key part of successful riding. We need to do the right thing no matter how much stress there is. Forget the stress and just ride like we know how. Consider your check ride practice for that part, too. I still heartily salute you for this journey!!! Most of the stress now is from wanting to do a perfect run rather than fear of failing. I guess this means that there's been a subtle shift in what I think I can achieve. I don't know when the big test is, but I know who the examiner will be - an ex-class one police officer from the UK who is now a serving officer/instructor here. Fortunately, I've met him a couple of times and he's a really nice guy. A bit behind the rest, but well done on your check ride. It really is a wonderful feeling when you think : "Hey I can do this." Amazing when you think that Roadcraft was designed for London Coppers in the '30's and it is still relevant and saving lives over 80 years later, not only in its native city but half way round the world, where conditions couldn't be more different. And I wonder what it is about Pan Europeans and Senior Observers ? In the two groups I belong to both SO's have ST1300's ! BTW did you mean to echo Corporal Jones from Dad's Army, or was that a happy accident ? Hi Young Dai and thanks for dropping in! Yep, it's an amazing training programme all right and I think its continuity as apposed to being a one-off training session contributes enormously to its success. Yeah, it's funny about the use of Pans. Also amazing that the riders are so darned good on them that they handle like Fireblades! I've just had contact from the Examiner for my full test which is likely to be in the next week, subject to confirmation today or tomorrow. He's a serving police officer, ex-class 1 UK so it's going to be a heck of a challenge to get through! Oh and yes, have always been a fan of Dad's Army!